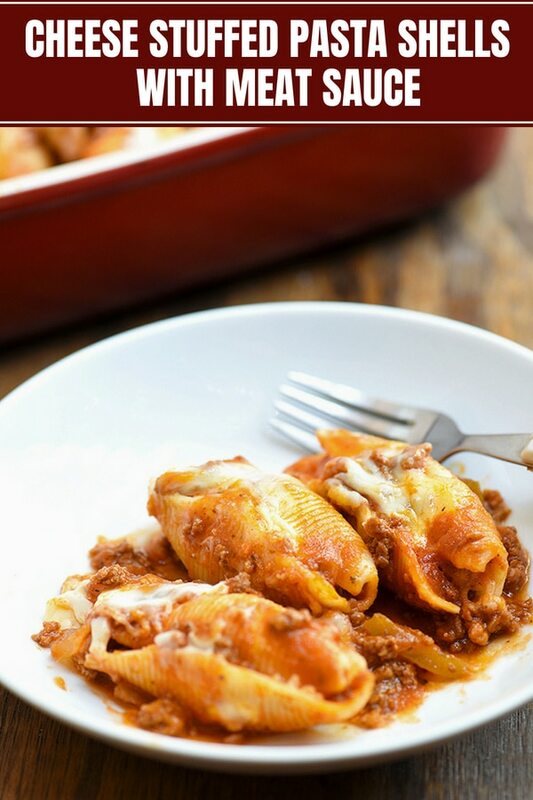 Stuffed Pasta Shells with Meat Sauce perfect for weeknight dinners or entertaining a crowd! 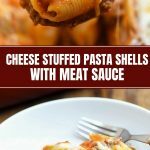 With jumbo shells, creamy ricotta filling and hearty meat sauce, it’s sure to be a family favorite! 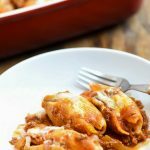 Ricotta-stuffed pasta shells are one of my favorite pasta dishes to make for weeknight dinners at home and for good reason. They take twenty minutes or less to prep yet tastes like you slaved in the kitchen all afternoon long. 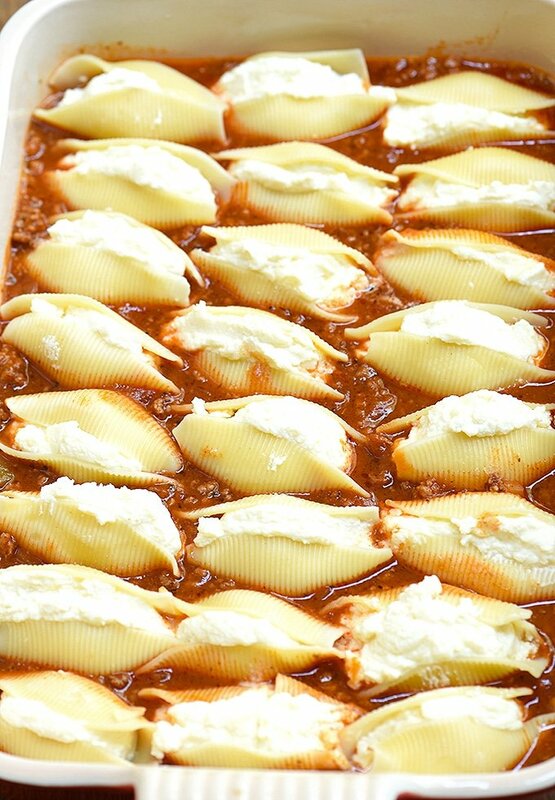 Today, however, we’re kicking up the flavors of these stuffed pasta shells to a whole new level of yum. 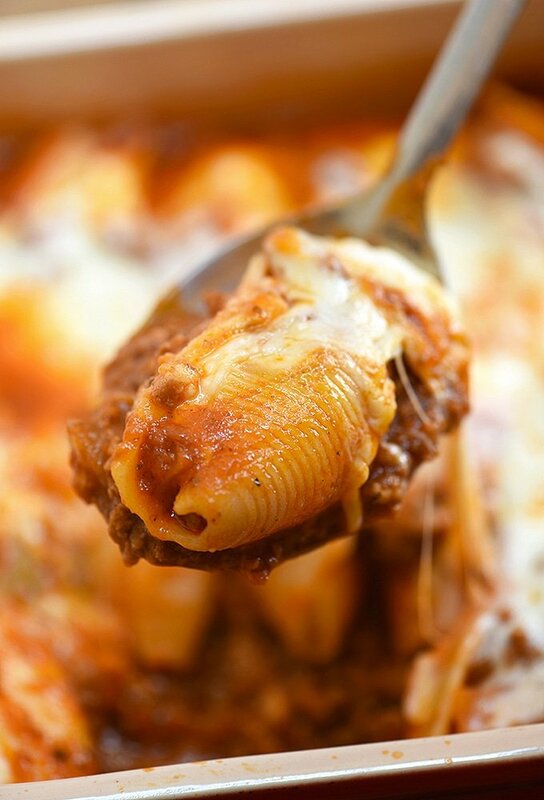 Along with the creamy ricotta filling, we’re baking them in a hearty meat sauce and MORE cheese! 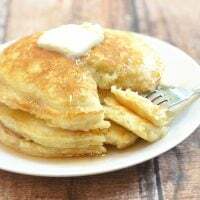 This recipe takes a bit more work than simply making it with marinara sauce but so worth the extra effort! To amp up the flavor and nutrition, add mushrooms to the bolognese sauce. Just chop about 1/2 pound and then brown along with the garlic, onions, and bell peppers. To add a bit of heat, swap part of the ground beef with Italian sausage. For al dente or “firm-to-bite” texture, boil the pasta a minute shy of the package directions as they will continue to cook in the sauce when baked. 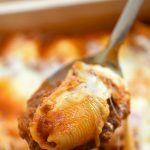 A 9 x 13 casserole dish would fit about 24 stuffed shells so you would need half of a 12-ounce box of jumbo shells which has approximately 46 shells. I recommend boiling a few extras to allow for breakage. The meat sauce will be very saucy and the dish will look a bit wet out of the oven. Give it a few minutes to set as the pasta will soak up most of the liquid. 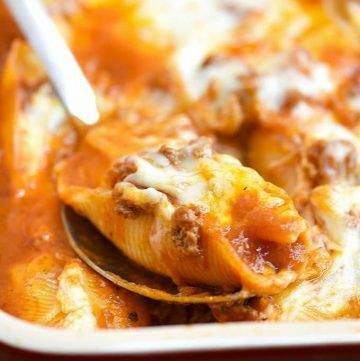 Not only is this stuffed jumbo shells pasta dish the ultimate comfort food, it’s also a great make-ahead meal. Prepare according to the recipe except the baking. 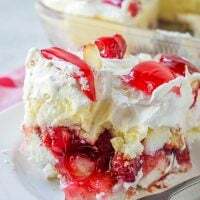 Arrange in a freezer-to-oven safe baking dish, cover tightly first with film and then foil, and refrigerate for up three days or freeze for up to three months. 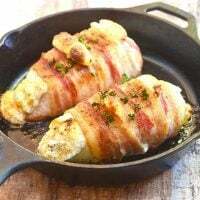 To freeze the stuffed shells without the sauce, arrange them in a single layer on a baking sheet, freeze for about 30 to 40 minutes or until firm, and transfer to airtight containers or resealable bags. Thaw the assembled pasta dish overnight in the refrigerator and bake in a 400 F oven for about 30 to 40 minutes or until hot and bubbly. 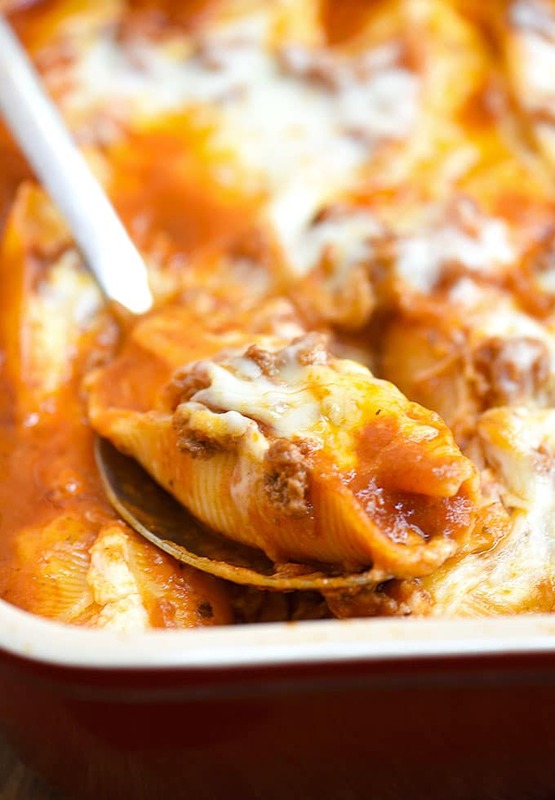 If using frozen shells, arrange them in a single layer with the meat sauce in a casserole dish and top with shredded cheese. Cover with foil and bake in a 350 F oven for about 50 to 60 minutes or until shells are hot and cheese is melted. 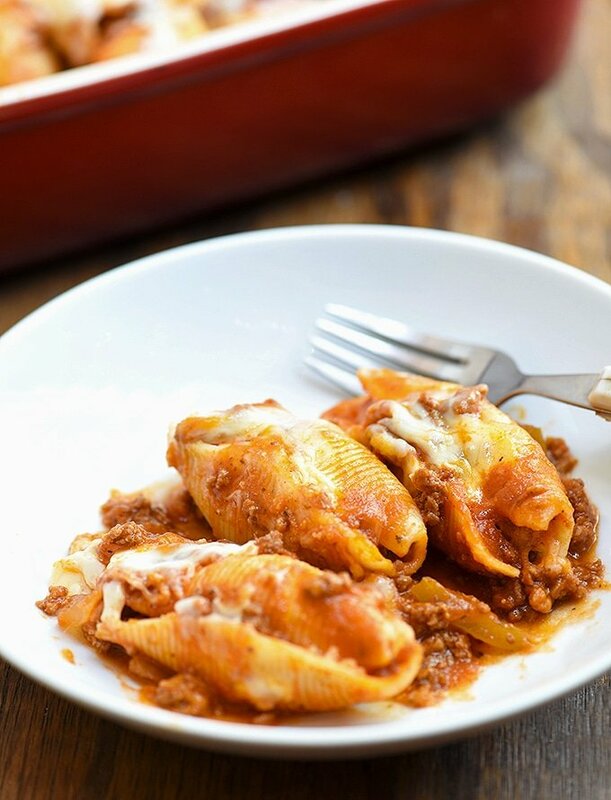 Give this stuffed pasta recipe a try for dinner tonight! It’s heart, full of flavor and makes a fabulous weeknight dinner meal with green salad and garlic bread. 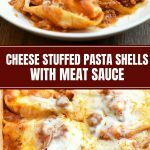 Cheese Stuffed Pasta Shells with Meat Sauce perfect for weeknight dinners or entertaining a crowd! 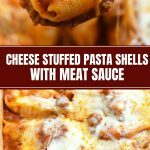 With jumbo shells, creamy ricotta filling and hearty meat sauce, it's sure to be a family favorite! In a large pot over medium heat, add ground beef and cook, stirring and breaking apart with the back of a spoon, until lightly browned and releases fat. With a slotted spoon, remove meat from pan and set aside. Discard grease except for about 1 tablespoon. Add onions, garlic, and sweet peppers and cook until softened. Add browned ground beef back to the pot. Add marinara sauce and beef broth. Stir to combine. Bring to a boil. Add sugar, salt, pepper, and Italian seasoning..
Lower heat, cover, and simmer, stirring occasionally, for 20 to 25 minutes or until meat is cooked. Meanwhile, in a pot of boiling water, cook jumbo shells about 1 minute shy of package directions. Drain, layer on a sheet pan, and allow to cool. In a bowl, combine ricotta cheese, 1/2 cup of the mozzarella cheese, Parmesan cheese, and egg. 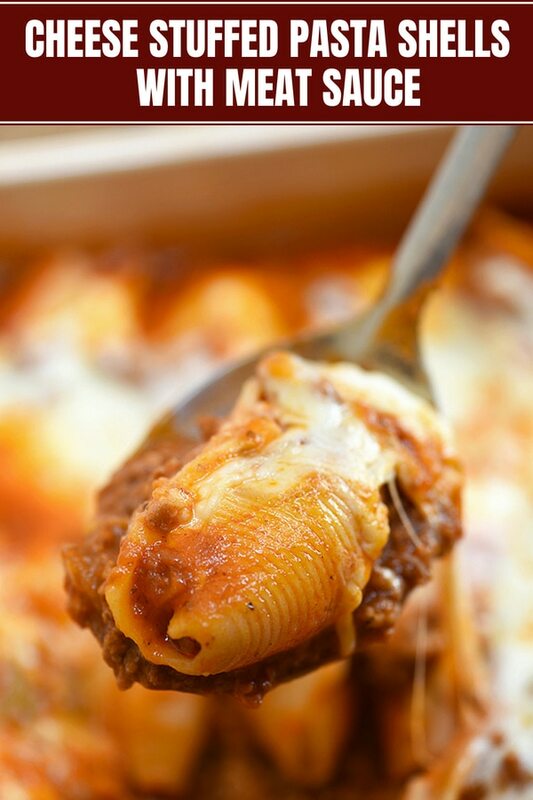 Using a small scoop or tablespoon, stuff pasta shells with cheese mixture. 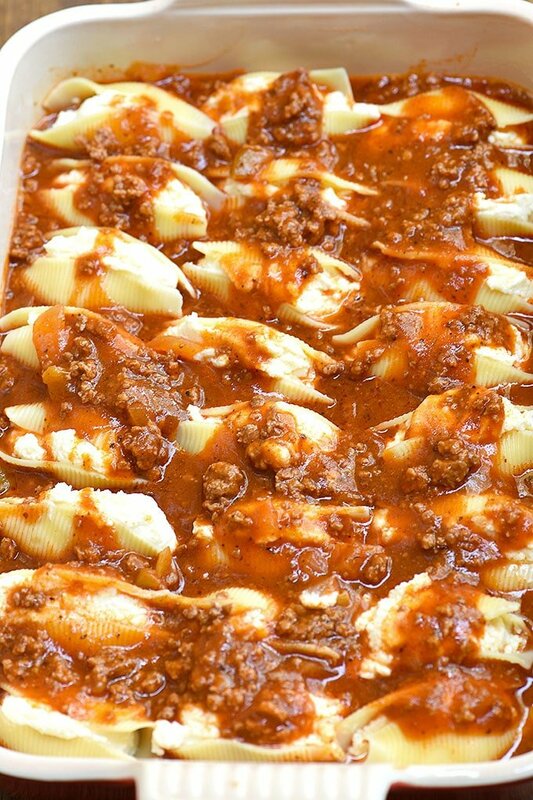 In a greased baking dish, add half of the meat sauce. and spread to cover the bottom of the pan. 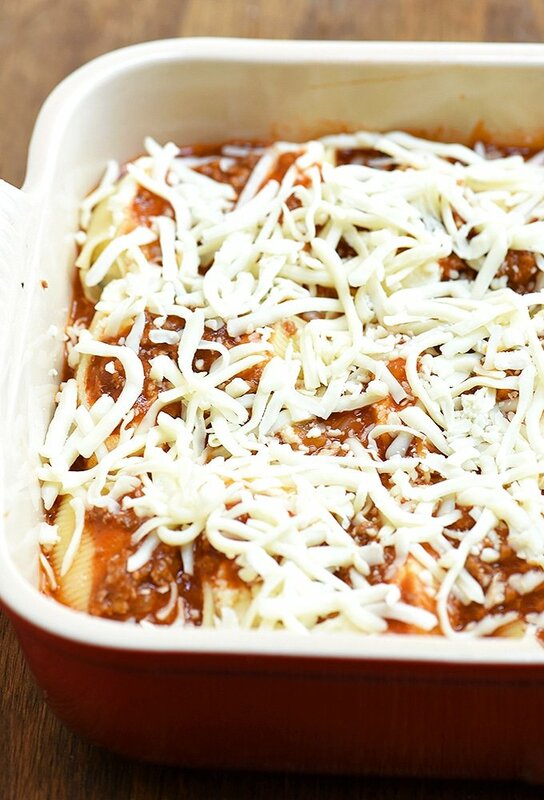 Arrange stuffed shells open side up in a single layer. Cover with remaining sauce and sprinkle top with the remaining 1 1/2 cups mozzarella cheese. Cover with foil and bake in a 400 F oven for about 30 minutes or until hot and bubbly and cheese is melted. Serve hot. 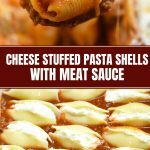 Nutritional Info calculated at 3 stuffed pasta shells per serving. These stuffed shell’s looks so tasty! adding these ingredients to my shopping list. 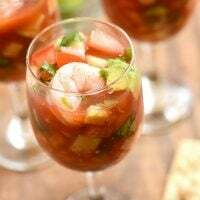 Wow this recipe looks AMAZING! My kids would absolutely love the shells. Thanks for sharing!